The switch goes up, the light goes on. The switch falls down: complete absence of light. Such is logic; such is the electricity that courses through that switch, giving it purpose, meaning; a usefulness that makes it difficult to live without. Where’s the mystery? Spirituality? What’s so divine about flicking the switch, even if it does change your environment and help you see things more clearly? 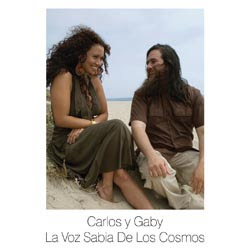 Listening to La Voz Sabia De Los Cosmos, collaboration between producer Carlos Niño and keyboardist Gaby Hernandez, you can hear a soul pulsing in the electricity that flows throughout this album, masquerading as pulsating quivers or delicately shorn fringes of an odyssey out the front door. The “switch,” in this case, does a little more than supply the juice. Flirting with electroscapes of sonic bleeps and dialogue, combining natural elements with mechanical ones, the ears are more or less treated to pleasantry more than anything else, spared the sometimes over abundance of mechanism and unimaginative “add and subtract” that gets employed over consistent dance beats. “Happy Summer Solstice (I Love You, I Laugh You)” and “Lunar Eclipse (So Close, I Feel I Could Touch It)” manage to emote well with reverberating shards of melancholy sound that dress up the keyboard strokes. “June Flowers (Bright Dancing Hearlight)” uses shaker percussion while flurries of electric chimes fly over a Spanish soliloquy. There are times though where Carlos and Gaby rely too much on sound-waves induced by synthesizer keys and whatever knobs you twist to create sonic fields of audio fog. Its momentary mixtures of instrumentation and collaged Spanish dialogue generate the album’s most interesting attributes and are somewhat underused in comparison to the generally hypnotic keyboard-only instrumentals. Supposedly a film score to a movie that’s in the works, La Voz Sabia De Los Cosmos is more or less a gorgeous array of sounds that are nicely arranged to create mood. It does its job in the score category, but makes a few leaps at becoming something deeper, gesturing at a little more than a filmgoer could hope to understand in the context of a storyline. I wonder if the album would’ve been more interesting if it had been meant as something other than background noise.